Amazing!!!! I got Second Born for free through Amazon. I read it a couple of weeks ago when I was bored. I couldn’t put it down. I LOVED the story and felt invested in the characters. I saw Traitor Born was coming out soon so I ordered it. I hoped it would be as good. It was even better than the first! I couldn’t put the book down. There was no good stopping point. I kept telling myself at the end of this chapter I have to stop and go to sleep. I didn’t stop until I finished the book. Now I’m wondering how I’m going to wait all the way til January for the final book?!?! The last sentence was a cliff hanger I didn’t see coming. With one sentence my whole mind was blown . . .
Roselle really comes into her own. She’s starting to accept the bigger picture. No spoilers but there is a particular party where her badass fighting skills come into play. You see that everything from the start of her life has shaped her for this. I enjoyed getting to see the vulnerable sides of her. She interacts with more First Borns in this book. You get to see her in their element and how she reacts. The boys definitely kept her on her toes. **Dune, her mentor and protector, has a much bigger role now. He’s prepared her for this her whole life but only now does she realize just how long this has been going on. He’s her father figure and the only person from her childhood who actually loved her. He has shaped her into who she is today and he will have a bigger impact on her going forward especially after . . . .
**Hawthorne was a big part of book one and I was interested to see how he would be part of book two after things changed. He taught her to open up and learn to trust. I was rooting for him. I was hoping there would be a way these two crazy kids could make it work even with him becoming a first born. I was shocked with the spoiler in this book. **Reykin . . . where to begin. I was secretly hoping sparks would fly in the last book between these two! She saves him, he saves her. We get to see a whole other side of him in this book. I liked that I got to know him. He wasn’t just some almost dead guy she saved who saved her back. We slowly got to peel back the layers and see the guy underneath. He says he doesn’t care and doesn’t have a heart but we all know better. It was obvious by all his actions in this book. I started rooting for him when he showed up in this book. After the way things ended between these two I’m dying to see what happens next!?!? I mean seriously with the sacrifice and then the last sentence of the book???? What are you doing to me Amy? There’s no way I will be able to make it until January. **Clifton, you sly devil you. I was right about you from the very beginning. You are self serving and always looking for how to help yourself. You are ten steps ahead of everyone else. I love you because you seem to truly care about Roselle. I know she’s a means to the end you want but I think you secretly care about her. You’ve been planning [spoiler] from the beginning. I wasn’t shocked when I read it but I’m wondering how that will all work out in the next book. I’d be ok with it but I’m hoping someone else gets the chance. **Agent Crow – I honestly hate you. You are the perfect villain. Every time I see you in the book I’m secretly hoping for your demise. I think of all the ways the other characters could take you down and kill you slowly. You were a slime ball in book 1 and your return in book 2 cemented my hate of you. I underestimated you. I think everyone from book 1 did. You were just a blip on the radar then but we should have all known you would be back with a vengeance. I want nothing more than Roselle to kill you slowly in book 3 with her family sword you still have in your possession. **Gabriel – I was hoping the brother Roselle loved would make an appearance. I was rooting for you to somehow get out from under your mother and join forces with your sister. It was the nice rainbow sprinkle happy ending I wanted. I should have known better. This isn’t about happy endings. I enjoyed your story. I feel like I know you a little better know and understand you especially seeing you through Balmora’s eyes. After reading the first book, I worried about two things coming into reading this book. First was considering there are 3 love interests (plus 1 stalker) for Roselle, I was concerned that the attention needed for each romance would be spread unevenly. Second was how to work out various factions helping Roselle without it seeming like she has all the advantages thus the enemy looking weak in comparison. As for my notion that Roselle having too many overpowered allies that make her success inevitable…the ending pretty much destroyed that thought. I’m not spoiling that so just read and you’ll know what I’m talking about. This book is awesome! READ AND ENJOY! Putting my thoughts about Traitor Born into a cohesive review has been difficult, but in a wonderful way. I read the book overnight the day I was granted access to it via Net Galley, and then again during a cross-country flight back to work a few days later. I’ll start by saying that Amy Bartol is an evil genius. This book has so many twists and turns that your head will spin into a different orbit. 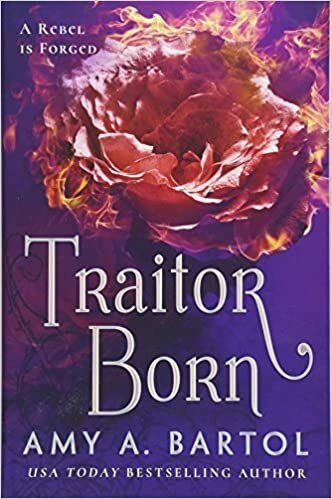 Traitor born is faced paced, covers a lot a ground, and really leaves me wishing Roselle could get at least a couple of days without trouble facing her just so she can relax and recover! I think I was harsh in my review for Secondborn, but I harbor none of those feelings for Traitor Born! Me, Reykin, Hawthorn, and Dune (probably): Roselle, no! Traitor Born starts right where Secondborn left off. There’s a lot of machinations going on with this second installment. It comes as no surprise that everyone wants a piece of Roselle, all while she’s just trying to survive. We get to see the Fate of Virtues for most of the book. Grisholm and Balmora were fascinating characters, and neither turned out to be what I expected. My one gripe here is that I still want to know *more* about and see the other Fates. The main conflict of this novel is still between Swords, the Rose Garden Society, and The Gates of Dawn. Its’ highly political, and Roselle has very little say in what happens to her in light of those three factions continually at war. Roselle is one heck of a heroine. She’s smart, skilled, and pretty much fearless when it counts. I appreciated her character development in this installment. Throughout Secondborn she felt too perfect and infallible. Here she’s still very much strong, but she’s not at all perfect. Her plans don’t go without a hitch. She gets into trouble… a lot. I appreciate learning more about Dune and his brothers. The origin of The Gates of Dawn is justifiable and heart breaking. Beyond the interactions of Reykin, Dune, and Walther (albeit extremely briefly) there is only talk of my favorite vigilante army (GoD). I was hoping to get to know Daltrey more, because he was enigmatic and compelling as all hell. I hope to see him play a significant role in Rebel Born. I loved getting to know Reykin Winterstrom. He was such a mysterious and striking presence the two times he was seen in Secondborn that I was sure he’d develop into a pivotal character at some point in the series. I didn’t expect to get so much of him so soon. He’s everything I wanted him to be and then some. Hawthorne Truegrave is around, but not nearly as much as I expected. I’m relieved that the relationship between Roselle and Reykin is not a romantic one. Roselle desperately needs friends she can trust. Reykin is protective, charming, and a friggen badass. <3 my Stars! Now for the ending. Traitor Born ends with the “Secondborn Trials” event that was briefly mentioned in the first book. You could try to guess what will happen here, but I guarantee you will be wrong. Dead wrong. I *DID NOT* see the ending coming. I actually swooned a little for Clifton Salloway in the bits leading up to the Secondborn Trials (which is saying something because he’s never appeared particularly trustworthy to me.) My jaw dropped with the events at the Trials. Dune? OMG, Dune. Then Reykin on the platform… I can’t even. I think my heart stopped for a moment. Then Agent Crow. Then Hawthorne! OMG. I lost count of how many times I whispered WTF during the final chapter.